Now that we have our project we will create a folder. We will create our folder using the Project Explorer view's popup menu. Activate the Project Explorer view and select the project 'JaneQUser' (the first project we created in the Project Explorer view). From the view's popup menu choose New > Folder. 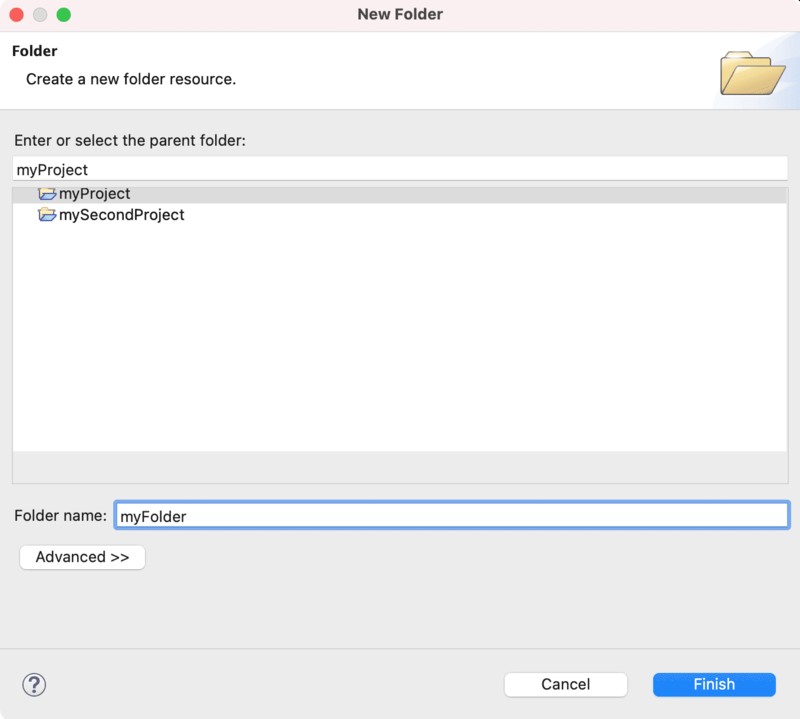 In the New Folder wizard, your project name appears by default in the Enter or select the parent folder field. This is because we chose to create the new folder from your project's context menu. In the Folder name field, type a unique name for your new folder, e.g. "JanesFolder". Depending on the platform you are running on, some characters will not be allowed (for example, "Jane's Folder?"). Click Finish when you are done. The Project Explorer view will update to show your newly created folder. Note: There is now also an Advanced button. This button when selected allows you to enter a location outside of a project's hierarchy as the location for one of its folders. This is called a linked folder.